Yangqu County is growing and urbanizing, but its rapid development has come with a cost. While the standard of living has increased, the community is experiencing depression, stress, peer-pressure on the local youth, and increased financial strain on marriages and families. To address some of these problems, we are focusing our efforts to expand Evergreen’s Yangqu Community Center by purchasing a larger space in order to have different activities simultaneously, instead of renting, as we are currently doing. The Regional Educational Development (RED) Project, Evergreen Hand-Cut Cards, and the Samaritan Program are all based out of the Yangqu Community Center. Young children and teens need a safe place to hang out. China is facing a major youth crisis; children are asking questions about the meaning and sense of life as the emptiness of wealth is becoming apparent to them. Social media platforms have changed China forever. Youth must be educated on its use and dangers. Parents ask for advice, especially as their kids are exposed to new ideas through the Internet. In our community center, our workers often talk with parents who are trying to navigate all the new problems. There is a hunger for education and knowledge but there are not sufficient libraries. 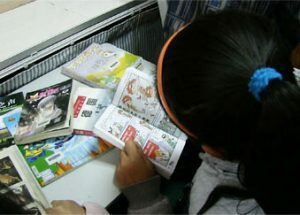 Children in China, even in this Internet age, love to read books and our current small library is packed on Saturdays—we would love to expand it. Also, training, teaching and support services are needed to help couples and their families. A high percentage of marriages in China are unhappy, and the divorce rate is increasing each year. Praise and thanks to God that he has provided enough funds for us to purchase a place; as such, we are currently searching for a suitable place.